Hi there EpicDuelists. With the year 2012 behind us, and new possibilities in front of us, I've written a brief overview of the story so far in EpicDuel! After years of an uneasy truce between the Legion's presence in Frysteland- the cold, mountainous region to the north of Delta V's main continent -- and the Delta V native Krampus, dictatrix Alydriah Descarl made a move to conquer those that remained relatively free from the Administration's control. Led by the formidable Commander Edgar Boothe, the Legion soldiers and corrupted Yetis fought aggressively against the primitive Krampus tribe. The Krampus, led by the Shaman Aldhagrimm the Erudite and King Alaric (the Technologically Impaired), the Krampus allied themselves with Exile forces but were ultimately defeated. In the aftermath, Alydriah set herself up as Queen over Frysteland and began the work of corrupting the local wildlife, including Ylwa the Demon Rider's personal mount Maia the Frost Demon. Boothe, torn between his loyalty to the Legion and love for his heritage saved some of the Krampus from execution, including King Alaric and Boothe's grandmother Aldhagrimm. The War coincided with Hank and his wife Valestra's Juloffenblotten festivities, ruining their winter holiday. With Alydriah distracted in Frysteland, a group of Legion loyalists who felt that Descarl had ultimately betrayed Baelius and the principles of the Legion made their first move against the despot. The Legion loyalists formed an alliance with the Exile Leader, whose base is contained within the ruins of Old Fortune City. The 12th District Administrator John Williamson III orchestrated a plot to bomb Alydriah's spire before she returned to the mainland. Williamson's son Lysander Cox (the Negawraith) disguised himself as the assassin Nightwraith and offered his services to Alydriah's brother, Administrator 11, while the Resistance -- represented by Habuki and Shadow Guard Mike -- planted bombs in the Spire. However, the plot was discovered, and Administrator 12 took full responsibility, sacrificing himself for his men and for Order. Despite his attempt to kill his executioner Administrator 11, the District 12 offices and the Administrator himself were reduced to ashes. Inspired by his father's death, the Negawraith took over both the 12th district administrative duties and the helm of the Legion Resistance. The Bionic Battalion Saga introduced a band of superintelligent sentient rabbits -- Brachylagus, Capensis, Myxoma, Lepus, and Mr. Cottontail, who built a set of rabbit battlesuits to fight and survive outside of the Biological Preserve. The rabbits discovered that they were descended from colonists from the planet Orychtolagus and devised a plan to escape Delta V. The Bunny Escape Pod was destroyed by a mysterious force, but Brachylagus and Capensis survived the attack. Meanwhile, Lepus attempted to make friends with the fearsome Electro Hazard and was rescued by Myxoma who “reprogrammed” the creature with her poisoned hair dye. Lepus discovered the Archives under the BioDome, which serve as a safe haven for the Archivists. The Archivists belong to an Order dedicated to preserving and maintaining Delta V's history, but they have since mostly died out leaving only Xraal and his siblings Tamaril, Sekk, and Navarro. 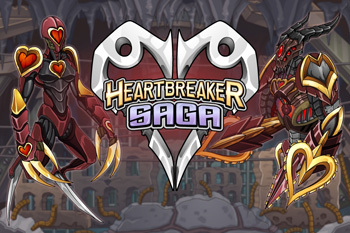 This was EpicDuel's biggest (and darkest) storyline to date. After years of searching, John “The Lawman” St. Alban was able to enter the mysterious Delta Vault, but not without opposition. John and his allies had to face off against not only the Legion forces led by Administrator 7, Silas Auer, but also the subterranean insectoid techno-organic creatures known as Mechachillids. 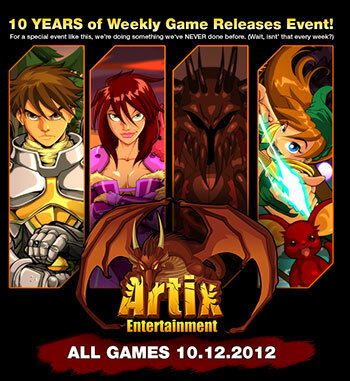 But this story started 20 years before the events of EpicDuel, and each of Auer's allies had their reasons to hate St. Alban. John's obsession with the contents of the Delta Vault led him to betray his partner in the Galactic Marshalls -- a young Silas Auer -- by sending the younger man's former lover Commander Valestra Acker (Hitchens) into the hands of Delta V's enemies. Valestra lost her arm during her escape, and when he confronted John about it, John shot off Silas's face. Along with Silas and Valestra, John fought against his daughter Ella and the man he blamed for seducing and corrupting her, the Nightwraith. But, in the end the Exiles and John's allies -- Ulysses and Galatea and John's younger daughter Selina -- were the first to infiltrate the Delta Vault and uncover its horrific content: by Baelius's order, Ulysses had developed a method of using a corpse to power a cyborg soldier (his wife Galatea was, in fact, one of these soldiers after having died in the Vault). He was sentenced to death, but survived his execution, losing his memory. Silas was not ready to accept his defeat, but John proved once again that he was not above underhanded tactics, threatening the child Silas had fathered with Valestra- Naomi. Silas surrendered himself to save his daughter. 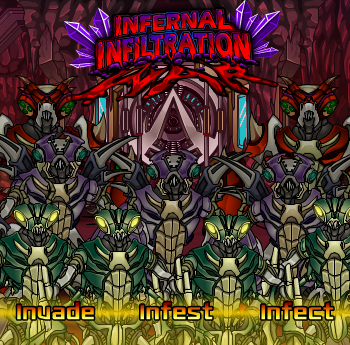 In EpicDuel's crossover with MechQuest, Delta V found itself facing the greatest threat it had so far encountered. Deep in the Barrens, a mysterious creature called Dravax the Harbinger warned of an apocalyptic fate that would befall Delta V unless they surrendered the woman named Char. This was Charfade, the last survivor from the Mer'a homeworld. 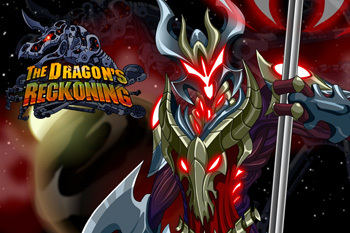 Dravax's Master is one familiar to players of MechQuest: a huge planet-devouring being known as the Dragonoid. Due to overwhelming support, the Citizens of Delta V banded together to save Charfade from the Dragonoid! The Slayer teamed up with players to defeat Dravax herself and gain access to Mirv's defense turret, but this only injured the Dragonoid. Though he doesn't advertise it, Mirv is a technical genius, and wrote a program that had to be directly implanted into the Dragonoid's brain. Players allied with Charfade to battle the Dragonoid Brain, replacing the coordinates of Delta V with those of the Slayer's plague-destroyed homeworld Delta IV. The Dragonoid consumed Delta IV (hopefully it was uninhabited) and Dravax was marooned on Delta V.
During Delta V's War for Independence, when Baelius turned on his backers to declare his venture a sovereign nation, there was only one investor that allied himself with Baelius -- the unscrupulous Chairman Platinum. The Chairman returned to Delta V to check up on his investment, and was unhappy with the way Alydriah was running things. To protect Delta V and her Citizens from the Chairman and his Corporate Ninjas, Citizens found themselves depending on an unlikely champion. In her first EpicDuel appearance, lead singer, guitarist, frog aficionado and frontwoman of One-Eyed Doll Kimberly Freeman used the citizenry of Delta V as her own personal Meat Shields as she defeated the silver-tongued Chairman Platinum. Seeing that death would be too great a mercy for the Chairman, Alydriah decreed that he should remain on Delta V.
With 2013 ahead of us, there are so many possibilities open for EpicDuel's story line. Will the Dragonoid realize it ate the wrong planet? What's on the other planets in the Delta system? Are there untouched areas of Delta V? When will we see the other Fortune City districts? And what about the characters? Will Hank and Valestra's marriage survive the constant obstacles thrown at them? Will the St. Alban family ever be repaired? When do we meet Brunson's Mama? Will Shadow Guard Mike ever be allowed to just kick up his feet and watch some television? 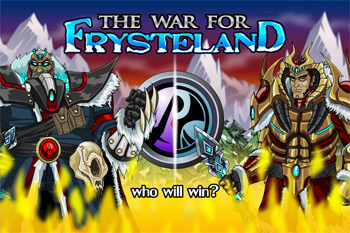 Will we incorporate more elements form the Lore-verse into EpicDuel or should we stay far, far away? What would YOU like to see in the coming year's storylines? Thank you all for being with us and your continued patience as we prepare to launch EpicDuel Omega and the latest adventures in Frysteland! I'm so honored to be creating this world for and with all of you, and working with the best team ever! I don't think I could write like this for anyone but them.